(PhysOrg.com) -- Researchers from the United States and Canada have found a fossil skeleton of a newly discovered carnivorous animal, Puijila darwini. New research suggests Puijila is a "missing link" in the evolution of the group that today includes seals, sea lions, and the walrus. The analysis of the skeleton and support for the hypotheses that pinniped origins can be found in the Arctic will be described in the April 23 issue of the journal Nature. Modern seals, sea lions, and walruses all have flippers—limb adaptations for swimming in water. These adaptations evolved over time, as some terrestrial animals moved to a semi-aquatic lifestyle. Until now, the morphological evidence for this transition from land to water was weak. "The remarkably preserved skeleton of Puijila had heavy limbs, indicative of well developed muscles, and flattened phalanges which suggests that the feet were webbed, but not flippers. 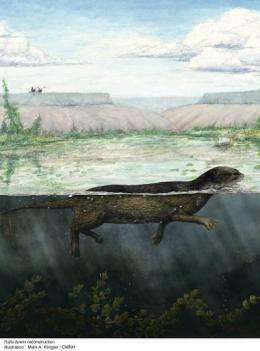 This animal was likely adept at both swimming and walking on land. For swimming it paddled with both front and hind limbs. Puijila is the evolutionary evidence we have been lacking for so long," says Mary Dawson, curator emeritus of Carnegie Museum of Natural History. Portions of the Puijila darwini specimen were found in 2007 in deposits that accumulated in what was a crater lake in coastal Devon Island, Nunavut, Canada. A subsequent visit in 2008 yielded the basicranium, an important structure for determining taxonomic relationships. Paleobotanic fossils indicate this location during the Miocene had a cool, coastal temperate environment, similar to present-day New Jersey. Given that freshwater lakes would freeze in the winter, it is likely that Puijila would travel over land to the sea for food. The transition from freshwater to saltwater in semi-aquatic mammals has been hypothesized for some time, first by Charles Darwin, who wrote in On the Origin of Species by the Means of Natural Selection, "A strictly terrestrial animal, by occasionally hunting for food in shallow water, then in streams or lakes, might at last be converted in an animal so thoroughly aquatic as to brace the open ocean." "The find suggests that pinnipeds went through a freshwater phase in their evolution. It also provides us with a glimpse of what pinnipeds looked like before they had flippers," says Natalia Rybczynski, leader of the field expedition. The animal is described as having a long tail, and fore-limbs comparatively proportionate to modern carnivorous land animals as opposed to pinnipeds. It is the first mammalian carnivore found at the site. Other fossils found include two taxa of freshwater fishes, one bird, and four mammalian taxa: shrew, rabbit, rhinoceros, and small artiodactyl (small short-legged herbivores, ancestors to modern giraffes and deer). The earliest well-represented pinniped, Enaliarctos—a marine form with flippers—has been found on northern Pacific shores of North America. It had been theorized for some time that pinniped evolution had been centered around the Arctic; the discovery of Puijila adds credence to this theory. More information: The Canadian Museum of Nature will be launching a new web section with further information on Puijila darwini. It can be found at www.nature.ca/newspecies .